Callaway Security is a full service security company and offers fire alarm repair and service for commercial and residential clients in Duluth, Georgia and the surrounding areas. If you are experiencing problems with your existing fire alarm system, it is important to get it fixed quickly to avoid putting your property, your family, or your employees at risk. You can trust Callaway Security to provide this very important service. We have over twenty years of experience servicing and repairing fire alarm systems. The fire alarm experts at Callaway Security are prompt, friendly, and effective when handling service requests. Our well-trained fire alarm technicians have experience and expertise with all the major brands and manufacturers of fire alarm systems including FireLite by Honeywell, Honeywell, GE Fire, Silent Knight, and more. We also provide service and repairs for combination burglary and fire alarm systems such as the Honeywell VISTA-128FB. In addition to providing fire alarm service and repairs, Callaway Security also inspects fire alarm systems for commercial and residential clients. We can provide you with the inspections that are required by the NFPA, building inspectors, fire inspectors, and insurance carriers. An inspection by Callaway Security is a great way to protect your family, tenants, employees and property. A thorough inspection of your fire alarm system helps to ensure that it will work properly in the case of a fire. Callaway Security is a family run business. We have spent the last twenty years establishing a solid reputation as a company that provides high quality security products and services. We are fully licensed and insured for your protection. 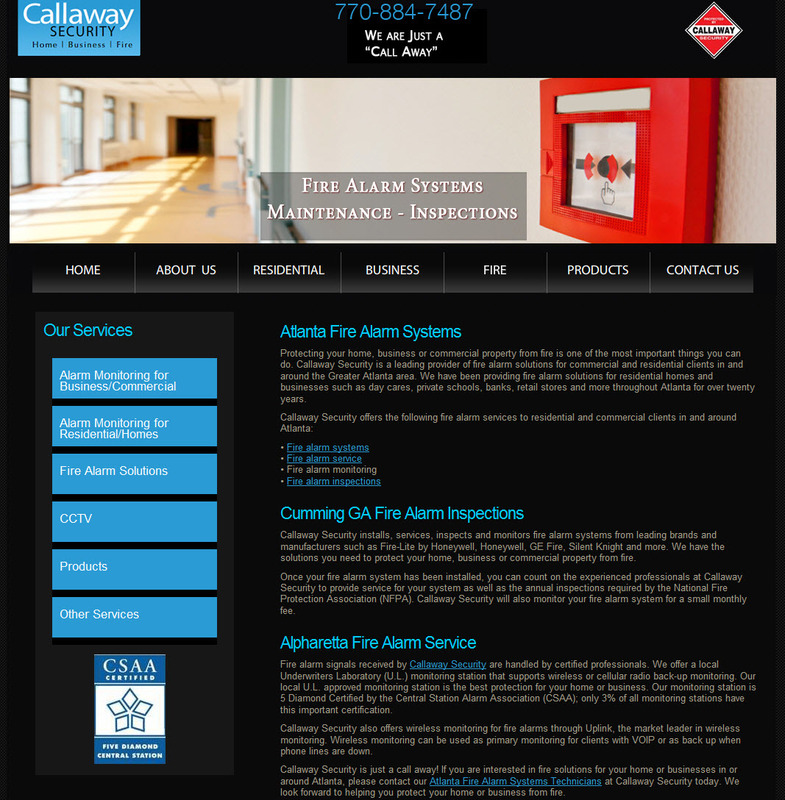 Callaway Security also offers wireless smoke fire monitoring of fire alarm systems. We are currently offering monthly rates as low as $21.99 for this service. If you have a fire alarm system that needs service or repair in or around Duluth, please call Callaway Security today. We look forward to working with you. Callaway Security - proudly servicing and repairing Fire Alarm systems in Duluth GA including Suwanee, Sugar Hill, Flowery Branch, Lawrenceville, Buford, and the surrounding Gwinnett County areas.